PACT is funded by the European Commission to promote awareness communication and training for professionals and institutions that actively work in the support chain for women and children survivors of violence. PACT promotes collaboration among stakeholders, offers training and builds a European network of expertise in the field of violence against women and children. Violence against women crosses all socio-economic levels, age, groups, races, religions and countries. Numerous studies have been published that document the prevalence of domestic violence and its serious effects on women. PACT seeks to act on the background of the support chain of women survivors of violence in Europe by increasing the level of awareness and knowledge among all relevant professional groups. PACT addresses professionals in education and vocational training as multipliers as well as various services offered to victims such as medical and psychological care, shelter, legal consultancy and empowerment. Training functions as a mechanism to raise awareness and change attitudes regarding violence against women. Specific training on violence includes the concept of gender, all forms of violence, the situation of victims, their coping and their support needs, influence of violence on health etc. The project will develop an innovative approach aiming at filling an identified training gap by providing training in the field of domestic violence to those target groups that work in different services in the field. The training kit that will be developed in PACT will also focus on a European exchange of knowledge and practice with view to different intervention models as well as on the promotion of a closer cooperation and networking of all relevant stakeholders. A common international workshop in Lisbon as part of the training will bring physically together representatives of various backgrounds and promote an international exchange that will have a positive impact on the work of involved local stakeholders of every partner country. The project started in January 2010 and was officially inaugurated with a virtual online meeting that took place mid-January with representatives of all seven partner institutions. During this meeting the first project steps were discussed and scheduled in accordance with the project design. The first task was to conduct a comprehensive desk research as well as interviews during which specific needs and wishes in terms of training and networking of local stakeholders working in the field were to explore. The research phase aimed to create a sound common basis for the development of a training concept and training modules by identifying current practice, legal implications, intervention models and by analysing existing education and training in order to identify fields of improvement. Research activities as well as interviews were conducted by means of specifically elaborated patterns and guidelines consisting of key points that needed to be considered to ensure comparable results. These key points were provided by the work package leader Orizzonte (Italy) that is currently compiling the transnational synthesis of the results. This principle of work package leader is applied in every work package, thus making sure that each partner has a defined responsibility according to the special field of interest and expertise. The synthesis will be available at the end of May and will give hints for the development of the training kit which will be started during the second transnational partner meeting in June in Malta. Even though the virtual meeting was a good starting point, a “real” partner meeting took place in March in Göttingen where the project partners met for the first time. The meeting was an excellent opportunity to get to know to each other and to intensively work and further plan the project and its activities. 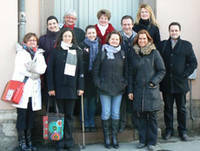 In the framework of the meeting local representatives of women’s associations, NGOs, police, training and social organisations were invited to join the transnational partner meeting in the framework of a European “fireside chat”. The event took place in the coordinator’s premises and offered largely time to share and exchange experience and information pertaining to the field of domestic violence. The problem could be closer to us then we think. Relatives, friends and colleagues can be victims, survivors… and perpetrators. Domestic violence is hidden in the home that should afford protection. It affects its victims in many ways. It knows no age, face, profession, economic means, culture, nationality. Social consciousness about domestic violence is made up of every individual’s awareness; social networks are signs of our time. We are taking advantage of increased awareness in the need to network. Communication between professionals who help victims of domestic violence is more important than ever. It offers complete support to those who need it most. The spot is co-produced with the Education 22 of the Ministry of Education that will also broadcast it periodically. The Maltese partner OAF is taking care of the production and first scenes were already taken. The clip is expected to be ready within the next weeks. The project website was implemented in March and offers information on the project. It will be updated regularly to allow an interested public to get a closer insight in the project work. For a special focus in PACT is put on a European exchange, which will be promoted among the involved associated local partners, adequate communication tools will be implemented on the project website at a later project stage enabling local stakeholders to get into contact with their European colleagues. Interested local stakeholders have the opportunity to present their work in the specific section on the website. For further information, please contact either the coordinator or one of the partner organisations.